Two hundred pieces of Insular Life Financial Literacy Children’s storybooks were donated to the school library of Epifanio Delos Santos Elementary School (EDSES) in a Turn over Ceremony attended by held at the EDSES Quadrangle at Malate, Manila on June 30, 2017. The storybooks were personally turned over by Insular Foundation Trustee Mr. Jesus Alfonso G.
Hofilena, Insular Foundation Administrator, Ms. Ana Maria Soriano with Ms. Teresita Melad, Insular Foundation Program Manager to the school officials of EDSES, represented by its Principal, Mrs. Edna Parcon, Education Program Supervisor, Mr. Vicente Victorio, with Public School District Supervisor, Mrs. Meriam Cervantes. The book donation is a response to the appeal of EDSES for help in sourcing out good, quality books for their students. It will benefit a total of 1,500 students in the Kindergarten, Grade 1 and Grade 2 levels, most of whom live in depressed areas in the City of Manila. The Insular Children’s Storybooks is composed of four titles – The Luckiest Girl in the World, Christmas in February, Wishing Well and Bisnesboy Mingoy. 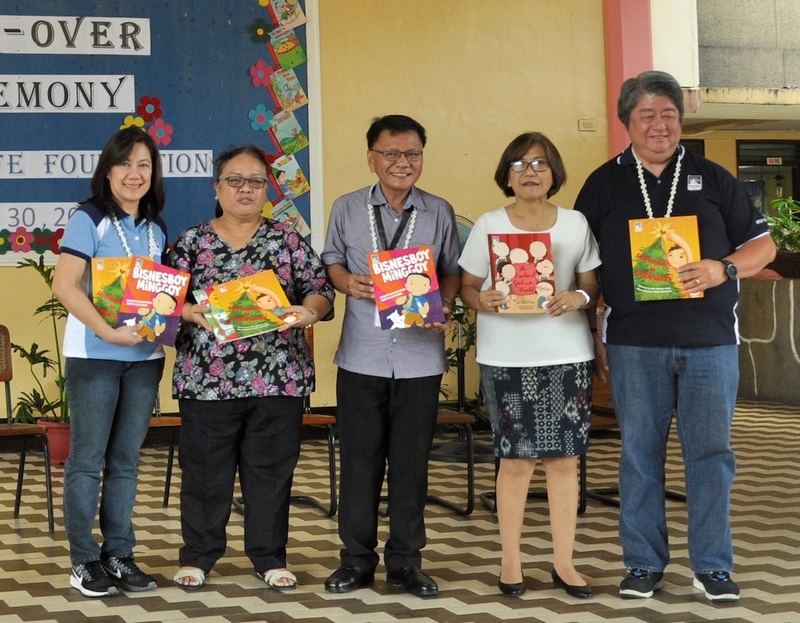 These books were produced by Insular Foundation in partnership with Adarna House in 2010 and 2012, with the intention of inculcating money values to the various grade school levels. With the storybooks, Insular Foundation hopes to inspire children to love reading as well as educate them at a very early age on the responsible way of handling money.